The inspiration from fractals is derived from concerns both aesthetic and pragmatic. Not only do they create interesting geometries and patterns, but they also give a practical advantage by increasing a surface area of a form. Fractal geometry is a field that mixes art with mathematics to demonstrate that equations are more than just a collection of numbers. What makes fractals even more interesting is that they are the best existing mathematical descriptions of many natural forms, such as mountains, biological structures, and coastlines (such as that which runs along the site of the artwork). Using fractal geometries in the planning and organization not only generates more electricity than a non fractal linear arrangement but also become more contextual to the site. The structural stiffness of the inclined structures supporting the photovoltaic panels can also be increased as the concrete pylons form together a type of folded-plate structure. 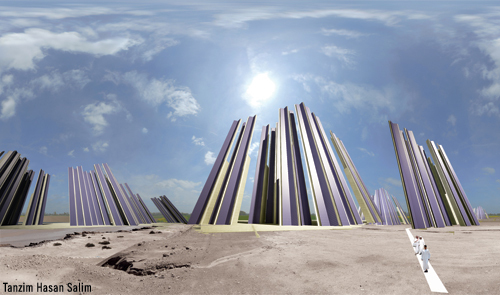 As a whole the project represents nature’s microcosm at a human scale. It is a celebration of nature and technology. The pylons are oriented to maximize efficiency by properly adjusting each photovoltaic panel to an optimum angle & also by eliminating segments of concrete panels that fall into shadow zones. 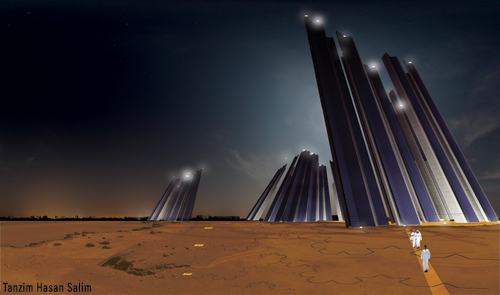 The total master plan would also incorporate fractals as pathways and landscaping elements.